Sprinkler Juice: Edge or Mow First? People have different ways of doing just about everything. Some water their lawns with an Orbit sprinkler system while others use rain barrels. 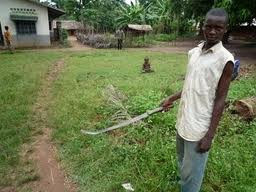 You might mow your lawn with a lawn mower but some folks in places like Panama cut their grass using a machete. Neither is wrong, it's just a different way of doing it. But which is more efficient? When it comes to mowing or edging first, we can ask ourselves the same question. A lot of people mow before they do anything else. Why? Some people like to mow first because it's the biggest task. They like to knock it out before anything else so they can see they're making progress with their chores or job quickly. But what happens? They mow, then they edge, and professionals or serious caretakers will trim and then blow. Their edging and trimming job made a mess of their driveway and/or walkway so they use a blower to blow it all up into a pile or back onto the grass. Is this a wrong way of taking care of your lawn? Not at all. Most professionals agree that if you edge and trim after you mow, you make a mess with the shavings that can easily be cleaned up by the mower, but it's too late now. If you mow last, the mower will pick up most of the trimmings you've thrown all over the place with your edger. But not all the trimming mess is on the grass. . You might be thinking to yourself, "Well sure, the trimmer makes a mess but the mower only picks up the shavings that land on the grass. The shavings are fine if their on the grass." Professional landscaper don't leave shavings on the grass because of a few factors. First, Pets like snooping around the yard. They will get the shavings all over themselves and track the clippings all over the place. And second, wind and other natural occurrences can cause the grass shavings to fly all over the place. There is no right or wrong way. It just depends on your priorities. If you like to mow first because you find that using the weed wacker to get any and all spots you couldn't get with your mower is an efficient way of doing things then great! Maybe you have a method that removes all the shavings from your lawn even though you mowed first. Maybe you don't care if there are grass shavings on your lawn! It's entirely up to you. 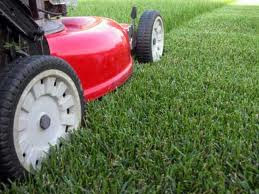 Professional landscapers will most commonly edge/trim first, then mow second. It must be a little bit more efficient, right? Again, you decide!